Poll: What are the chances of Alabama A&M pulling off an upset win over Auburn? North Carolina A&T State University led the way in this year’s All-MEAC voting as the Aggies had 12 student-athletes named to the first team. The team is voted on by the MEAC’s head football coaches and sports information directors. 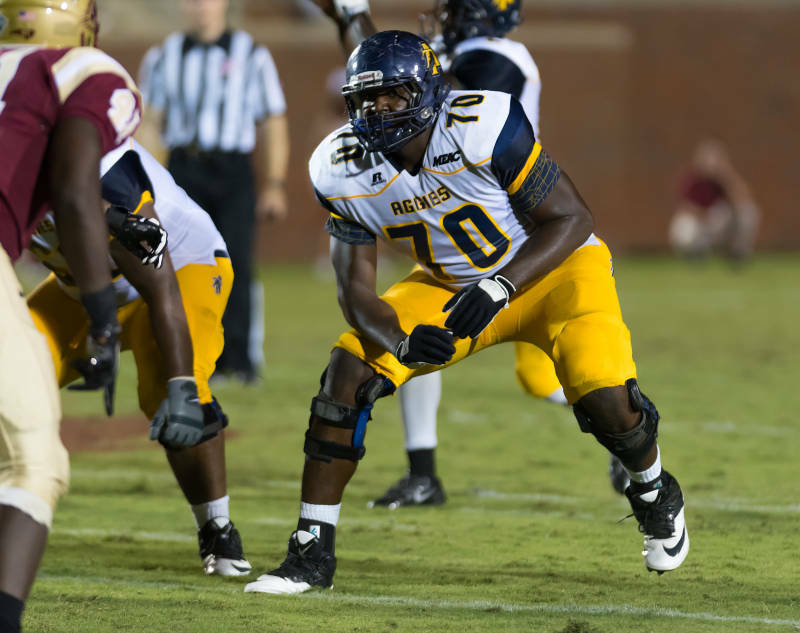 North Carolina A&T State’s Brandon Parker made history as the first player to be named MEAC Offensive Lineman of the Year for three consecutive seasons. 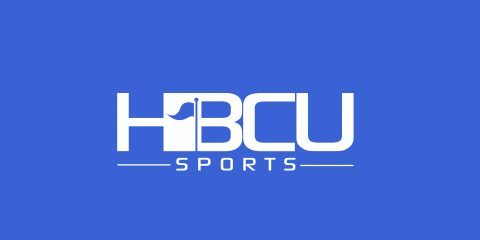 Howard University freshman Caylin Newton was tabbed as the league’s Freshman of the Year while North Carolina A&T State’s Rod Broadway was selected as Coach of the Year. In a partnership with the National Football Foundation (NFF) & College Hall of Fame, the league’s Offensive and Defensive Players of the Year will be announced as part of the festivities surrounding the 60th NFF Annual Awards Dinner, Tuesday, Dec. 5, at the Hilton Midtown in New York City. The event will be televised live on ESPN3 at 9 a.m.
Parker capped off his final season in dominating fashion as he was named MEAC Offensive Lineman of the Week seven times while serving as the anchor of an offensive line that allowed the least amount of sacks in the MEAC. The Aggie offense put together one of their finest offensive seasons in university history as they led the MEAC in scoring offense (36.4 ppg), pass offense (257.5), first downs (231), 3rd down conversions (42.9%), 4th down conversions (61.5%) and time of possession (32:57). The Kannapolis, N.C. native and Walter Payton Award nominee finished the season without allowing a sack as N.C. A&T finished the regular season with eight games over 400-plus yards of offense. Newton stepped onto the college football scene in style as he helped lead Howard to its first-ever FCS win at UNLV in his collegiate debut. From that point, Newton couldn’t be stopped as he guided the MEAC’s top-rated offensive unit (447.8 ypg) and rushing offense (217.4 ypg). Newton was the first freshman in MEAC history to surpass 3,000 yards of total offense (3,185) as he averaged 289.5 yards of offense per outing. The Jerry Rice Award nominee also led the MEAC in scoring as he combined for 25 touchdowns en route to leading Howard to its best finish and record since 2012. All Broadway did in 2017 was win as the Aggies capped off their best regular season in school history with a perfect 11-0 (8-0 MEAC) mark. The Aggies are one of only two undefeated teams in FCS play and are the 2017 MEAC champions for the third time in four years. For the first time in 14 years, the Aggies are the outright conference champions. The Eddie Robinson Award nominee became the school’s second all-time winningest coach this season and has reached 50 wins faster than any other coach in school history, getting his 50th win at N.C. A&T in 72 games coached. Broadway has one more game remaining as the Aggies will play in its second Celebration Bowl on Saturday, Dec. 16 at the brand-new Mercedes-Benz Stadium in Atlanta. No MEAC team has finished the season with both a perfect regular season and postseason mark. QB Lamar Raynard R-Jr. North Carolina A&T State High Point, N.C.
RB Marquell Cartwright Jr. North Carolina A&T State High Point, N.C.
RB Anthony Philyaw Sr. Howard Los Angeles, Calif.
WR Elijah Bell So. North Carolina A&T State Wheeling, W. Va.
WR Jequez Ezzard So. Howard College Park, Ga.
TE Trey Scott Gr. North Carolina A&T State Powder Springs, Ga.
C Darriel Mack Sr. North Carolina A&T State Clio, S.C.
OL Brandon Parker R-Sr. North Carolina A&T State Kannapolis, N.C.
OL Gerald Wright Sr. Howard Miami, Fla.
OL Marcus Pettiford So. North Carolina A&T State Durham, N.C.
OL Dwayne Brown Jr. Bethune-Cookman Indianapolis, Ind. DL Darryl Johnson So. North Carolina A&T State Kingsland, Ga.
DL Kawuan Cox So. North Carolina Central Summerville, S.C.
DL Chris Lee Sr. Norfolk State Woodbridge, Va.
LB Darius Leonard R-Sr. South Carolina State Lake View, S.C.
LB Reggie Hunter Sr. North Carolina Central Henderson, N.C.
LB Jeremy Taylor Sr. North Carolina A&T State Kinston, N.C.
DB Davanta Reynolds Jr. North Carolina Central Tucker, Ga.
DB Franklin (Mac) McCain III Fr. North Carolina A&T State Greensboro, N.C.
DB Diquan Richardson Sr. Bethune-Cookman Allen, S.C.
DB Timadre Abram Jr. North Carolina A&T State Lakeland, Fla.
P Nathaniel Tilque Sr. North Carolina Central Charlotte, N.C.
PK Uriel Hernandez Jr. Bethune-Cookman Homestead, Fla.
RS Khris Gardin Jr. North Carolina A&T Morganton, N.C.
QB Caylin Newton Fr. Howard Atlanta, Ga.
RB Yahkee Johnson Sr. Hampton Richmond, Va.
RB Isaiah Totten R-Fr. North Carolina Central Apex, N.C.
WR Jacen Murphy Sr. North Carolina Central Wilmington, N.C.
WR Ronald Bell So. Hampton Fort Washington, Md. TE Josh McCoy Jr. North Carolina Central Sharon, S.C.
OL Marley Conley Jr. North Carolina Central Fayetteville, N.C.
OL Nick Leverett So. North Carolina Central Concord, N.C.
OL Obinna Nwankwo So. Florida A&M Miramar, Fla.
OL Ryan Gould Sr. Hampton Clemmons, S.C.
DL Todney Evans Jr. Bethune-Cookman Delray Beach, Fla.
DL Antonio Brown Sr. North Carolina Central Jacksonville, Fla.
DL Malachi Washington Jr. Morgan State Waldorf, Md. DL Ty Cravens Sr. South Carolina State Austell, Ga.
LB Dayshawn Taylor R-Sr. South Carolina State Lincolnton, Ga.
LB Anthony Smith R-Sr. Norfolk State Norfolk, Va.
LB Raheim Huskey Jr. Hampton Gaffney, S.C.
DB Jason Baxter Gr. South Carolina State Manning, S.C.
DB Alden McClellon Jr. North Carolina Central Lake Butler, Fla.
DB Keyjuan Selby Jr. Delaware State Bear, Del. P Fidel Romo-Martinez So. Delaware State Banning, Calif.
PK Aedan Johnson Jr. North Carolina Central Chula Vista, Calif.
RS Marcus Taylor Jr. Norfolk State Highland Springs, Va.
QB Larry Brihm, Jr. Sr. Bethune-Cookman Delray Beach, Fla.
RB Devin Bowers Jr. Florida A&M St. Petersburg, Fla.
RB Jamurez Tompkins Sr. Bethune-Cookman Tampa, Fla.
WR Kyle Anthony So. Howard Miramar, Fla.
WR Marcus Taylor Jr. Norfolk State Highland Springs, Va.
C Osman Aguilera Sr. Florida A&M Miami, Fla.
OL Phillip Norman Jr. Bethune-Cookman Sebastian, Fla.
OL Justin Evans Sr. South Carolina State Florence, S.C.
OL Kenneth Kirby So. Norfolk State Newport News, Va.
OL Malik Mackey So. Hampton Atlanta, Ga.
DL Nigel Chavis R-So. Norfolk State Richmond, Va.
DL Brandon Carswell Jr. Savannah State Mount Vernon, Ga.
DL Elijah Price Sr. Florida A&M Jacksonville, Fla.
DL Steven Smith Sr. Hampton Virginia Beach, Va.
LB Marcus Albert Sr. North Carolina A&T College Park, Ga.
LB Rico Kennedy So. Morgan State Fort Lauderdale, Fla.
LB Kyle Archie Sr. Norfolk State Virginia Beach, Va.
DB J.T. Wahee So. Norfolk State Norfolk, Va.
DB Carl Garnes Jr. Morgan State Columbus, N.J.
DB Brendan Cole Sr. Hampton Hampton, Va.
DB Devondre Powell Sr. South Carolina State Miami, Fla.
P Chris Faddoul Fr. Florida A&M Wesley Chapel, Fla.
PK Tyler Scandrett Sr. South Carolina State Barnesville, Ga.
RS JaMichael Baldwin Fr. Savannah State Conyers, Ga.